Hey Seibertronians, you remember those Metal Earth Transformers model kits that came out a while ago? Well, today we have a new piece of info coming from yours truly; It seems that elusive gold Bumbebee kit has finally hit retail! This, how you say, "Gold Bug" wink wink was spotted at Gryphon Games and Comics in Ft. Collins, Colorado. It's literally been a long time coming for this Bee variant, as Big Bad Toy Store put his pre-order up over a year ago with release apparently planned for this month. Check out the photo of the kit below and tell us if you've seen him around recently as well in the comments below, and remember to send any sighting you think might be new our way! this is news? i've seen this at Bedrock city comics in Houston TX for about a month now, maybe longer. SG Roadbuster wrote: this is news? i've seen this at Bedrock city comics in Houston TX for about a month now, maybe longer. Come on in, the electrum's fine! Sorry I don't have the exact store name, and I kind of saw this a while ago, but if it helps, I saw this product at the Houston, TX Memorial City Mall in one of the "novelty" and game/figures stores along with a couple of Titans Return figures and RID 2015 figures. As for the Titans Return, I think it was: Skywarp, Stripes (I have never heard of this guy before to be honest) and a couple of Astrotrains. For RID 2015 there was Drift, Windblade, and I'm pretty sure it was Sideswipe. Sorry, I didn't know that people were looking for this. They have a ton of the gold version inside Universal Studios Florida at the Transformer ride. 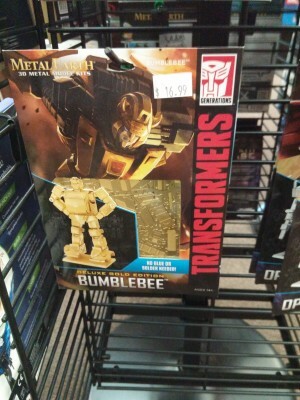 They had the gold Bumblebee as well as silver versions of Bumblebee, Soundwave and Megatron. Optimus was sold out. 4,985 pages were recently viewed by 663 unique visitors. This page was viewed 1 times on Wednesday, April 24th 2019 9:02pm CDT. © 2019 Seibertron, Inc. DBA Seibertron.com. All Rights Reserved. Established June 2000. Seibertron.com is owned by Ryan Yzquierdo.